"Very cool! This for SE-Cloud or SE-PHP?" "On this profile which is my own personal one. Have got a few more for other companies I work with over the past few years. I am not new to SE Jung!!! And don't appreciate the way you guys & girls are sidelining SE-PHP development." "Well that about sums up my total investment of over $3000 in SE from V.2 to V.4 :-( From now on I am going to support the guys on a hacking SE forum site and only use NULLED software! If SE don't support me then why should I support SE!!!!" 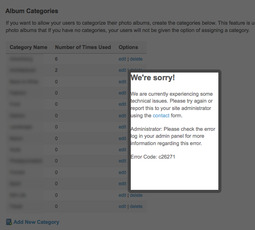 I am getting an error when adding new Categories in the Photo Albums Plugin. So I email support@socialengine.com reporting this bug I have found. Only to get 2 reply's from 2 different people telling me to log a support ticket. That sounded ok to me and tried to do so with the link they sent me. Only to find out that I have to pay an extra fee just to report a bug. WTF is this about??? I have 2 more projects for clients that requested Social Network type sites.... I will be recommending PHPFOX to them. Looks like the guys & girls at SocialEngine are way to busy making money out of SE-Cloud to bother about us!!! seTweaks Your 30 days free support is probably finished. that's why they are asking you to pay to extend your support period for another 30 days. you can copy the log for that error code here and someone may help you. SE 4.3 ever going to happen? Renaldo YEAH!!! THIS PEOPLE ARE P.O.S THEY DON'T RESPOND TO ANYTHING WE HAVE SAID AND JUST DECIDED TO IGNORE CUSTOMERS. WHERE IS THE UPDATE 4.3 ???????? ?